On Monday May 14, 2018 in Strasbourg (France), EAS represented by EAS President Prof. Dr. Capranica, has been elected as Member of the new Consultative Committee (CC) Bureau of the Enlarged Partial Agreement on Sport of the Council of Europe. To contribute to better governance, ethic, inclusive, and safe sport, the Enlarged Partial Agreement on Sport (EPAS) is the platform of the Council of Europe for co-operation between public authorities of its Member States. In a series of contested elections, the EPAS Consultative Committee re-composed its Bureau by admitting two new members: ENGSO (European Non-Governmental Sports Organisation) represented by its President Carlos Cardoso, and EAS (European Athlete Student Network) represented by President Laura Capranica. 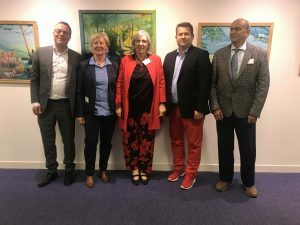 The Secretary General of EU Athletes, Paulina Tomczyk, was re-elected, as was Co-President of EGSLF (European Gay & Lesbian Sport Federation), Annette Wachter. The Executive Committee of the 15th annual conference of the European Athlete Student – Dual Career Network would like to invite you to participate in this meeting to be held in Coimbra, Portugal between 12th – 14th September, 2018. The EAS annual conference brings together experts in all fields related with the educational and sport systems to present and discuss state-of-the-art research and conceptual and political issues. The theme for the 2018 Conference is: “Establishing an effective framework in dual career”. The 2018 Conference will include presentations on areas like the globalization, the dialectic relationship between club and high school, university sport (will be a post European University Games event – EUSA Games will be held in Coimbra in July, 2018) and sport and governance. As in the previous EAS conferences we aim to attract many early career researchers, but also well-known experts to ensure valuable information exchange. The friendly and open nature that characterizes the EAS conference has the potential to foster future projects, collaborations and friendships. The Bengt Nybelius scholarship for young investigators is an opportunity for young scientists to have their work recognized by their peers. The symposium venue will be held at the Museu da Ciência in the historical site of the University of Coimbra, which has been classified as World Heritage by UNESCO for its role as the centre of production of Portuguese language literature and thinking and for the universal value of its campus. The University of Coimbra was created in 1290 and is the oldest institution of higher education in Portugal. It is also one of the oldest universities in the world with more than 700 years of experience in education, training and research. Accommodation will be available within walking distance of the symposium venue as well as from the main cultural and tourist sites. When coming to Coimbra you will experience the historical heritage of one of the oldest cities of Portugal, with its monuments and museums, but also the relaxing atmosphere of its restaurants and bars, where you can enjoy traditional Portuguese dishes and wines. If you long for the ocean, the Atlantic Portuguese coast with its white sandy beaches and seafood restaurants is only 40 km away. As well, you may also enjoy the wine tourism circuit around the city. We hope that you will be able to join us in September 2018 for 15th EAS annual Conference. 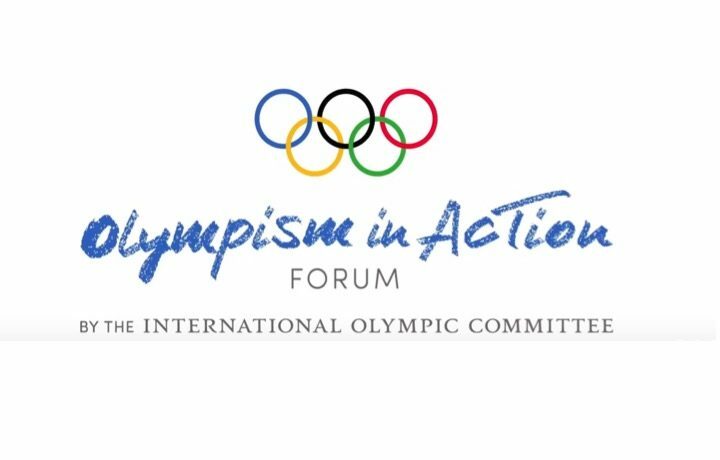 EAS is honored to be invited to the first “Olympism in Action Forum” at 05./06. October 2018 in Buenos Aires, right before the Youth Olympic Games will take place there. We will take a stand for athletes rights on Dual Career and the needed frame work on that international highly demanded topic. to be held in Coimbra, Portugal on July 14-15, 2018. This prestigious event is part of the 4th European Universities Games to be held in Coimbra on July 15-28, 2018. In particular, President Laura Capranica will share the EAS vision at the round table “Promoting Dual Career: a key issue for educational system” and will attend theOpening Ceremony of the 4thEuropean Universities Games 2018, which are the largest European multi-sport student event aimed at promoting friendly competition, friendship, unity and tolerance between European university students. 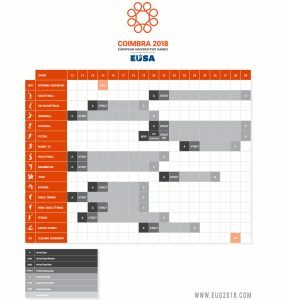 EAS as will be represented in Coimbra as well by Secretary General Joerg Foerster, who is a member of the Technical Commission and the actual Technical Delegate for Volleyball within EUSA. Being one of the oldest Universities in Europe, in 2018 the University of Coimbra will host from 12th to 14th of September the 14th Annual Conference of EAS, which is a perfect opportunity to discuss the state of the art and the future of dual career of European athletes as students through exchanges of examples of good practices, ideas, experiences, researches, and progresses of European projects. On March 29-30, 2018 the University of Trento (member of EAS) organized the Sport Forum of Italian Universities to promote university sport training, research, innovation and practice. Rector Paolo Collini and Prof. Paolo Bouquet opened the event and prized the University of Trento athletes member of the dual career TOPSport programme, who represented Italy at the 2018 Winter Olympic Games. Dr. Paolo Bertaccini (Office of Sports of the Italian Presidency of the Council of Ministers), Laura Capranica (President of EAS), dr. Marco Arpino e Daniela Drago (Italian Olympic Commitee, CONI), Andrea Altmann (Vice President of the European Network of Academic Sports Services, ENAS), Lorenzo Lentini (President of the Italian University Sport Center, CUSI) addressed the delegates of 25 Italian Universities on issues related to dual career of athletes, research and innovation in sports, and sport practice and services for university students. During both plenary sessions and workshops, the participants had the opportunity to share projects and experiences related to university sports and to envisage concrete proposals for the development a common vision on sport practice at elite level and engagement in active lifestyles of students. Specifically, the debate on dual career focused on the definition of elite athletes, the minimum requirements for access and permanence in dual career paths, the criteria for ECTS recognition of sport participation and achievements, and the university services to be provided to athletes and students. Indeed, EAS recognizes Prof. Paolo Bouquet as one of the most proactive members of EAS in disseminating dual career at Italian level. On March 22 and 23 the President Laura Capranica represented EAS at EU Sport Forum 2018 ‘Sport in Europe, investing for future generations,’ organized in Sofia by the Bulgarian Presidency of the Council of the European Union. 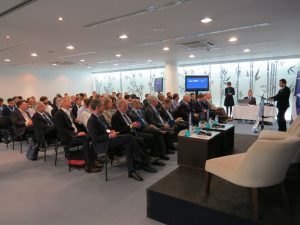 The event involved 380 policy makers and key sports stakeholders, in addition to a live webstreaming audience. The main focus was on the impact of the Olympic games, the role of sport in the development of cities and regions and in fighting climate changes, the promotion of European values through sport diplomacy, the advancement of gender equality in sports and the transfer of athletes, the innovation of technologies and e-sports, and the need of supporting healthy active lifestyles in light of the Euroberometer 472 findings. These topics were discussed during both plenary and parallel sessions, which ensured a female representation in support of the No Women No Panel Campaign. The 2018 EU Sport Forum was opened by the EU Commissioner for Education, Culture, Youth and Sport Mr Tibor Navracsics, the Bulgarian Minister of Youth and Sports Mr. Krasen Kralev, the Mayor of Sofia Mrs. Yordanka Fandakova. During the event, EAS has the opportunity to meet also with the European Commission’s Policy Officer Ms Agata Dziarnowska, the EUSA Secretary General Mr. Matjaz Pecovnik and the Communications and Projects Manager of the EUSA Institute Mr. Andrej Pizsl, partner in the dual career projects Education Model for Parents of AThletes In Academics (EMPATIA) and associated partner in Athletic Migration: Dual career and qualification in sports (AMID). The Head of Sport Unit Mr. Yves Le Lostecque and the Deputy Director General for Education, Youth, Sport and Culture Mr. Jens Nymand Christensen closed the 2018 EU Sport Forum, which emphasized the crucial role of sports in sharing European values. 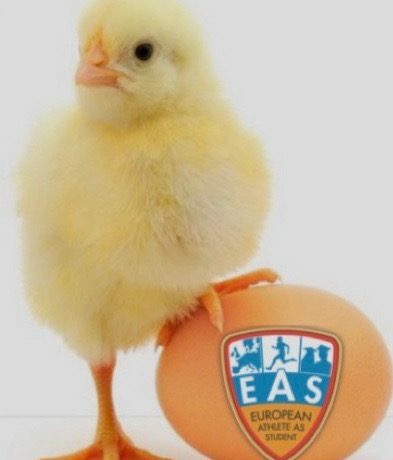 the EAS Executive Committee wishes you an Easter full of joy and peace! Easter is also an occasion to update you on the most recent EAS activities. President Laura Capranica and Secretary General Joerg Foerster represented EAS in the kick off meeting of the EU-funded EMPATIA project (January 25-27; Rome, Italy). Coordinated by the University of Ljubljana and involving EAS, the University of Rome Foro Italico, the University of Limerick, the University of Coimbra, INSEP, EUSA, CONI, Sport Ireland Institute, and Ginasio Clube Figueirense, EMPATIA aims to structure an evidence-based e-learning multi-lingual educational programme specifically tailored for dual career parenting. EAS was present at the EU SPORTinfoday (January 30, Brussels, Belgium), represented by President Laura Capranica, Secretary General Joerg Foerster, and Treasurer Mojca Doupona-Topic. The event provided useful information on funding opportunities in 2018 (more information is available at: http://eacea.ec.europa.eu/home/erasmus-plus/actions/sport_en) and allowed to envision projects. Therefore, at present EAS and several EAS members are finalizing Cooperative Partnerships applications on dual career to be submitted on April 5, 2018. President Laura Capranica represented EAS at the kick off meeting of the EU-funded AMID project (February 6-10, 2018; Salzburg, Austria), which aims to facilitate the athletic and academic careers (e.g., dual career) of migrating athletes by envisioning DC mobility measures. The project is coordinated by the University of Salzburg, and involves EAS, the University Sport Service of Hamburg (represented by EAS Secretary General Joerg Foerster), the Lapland University of Applied Science, the University of Cassino and Southern Lazio, and the University of Ljubljana. Honorary President Tibor Kozsla attended the first meeting of the Expert Group Skills and Human Resources Development in Sport (XG HR) in the City of Bath, United Kingdom, on February 20 to 22, 2018. The main goal of the XG HR is to promote the development the European dimension of sport, including the implementation of dual career of athletes. On February 26, President Laura Capranica illustrated the aims and activities of EAS at the Institute of Sports Sciences of the University of Taipei, which is the top research-based graduate program of Taiwan. On March 29-30 EAS has been invited at the University of Trento to present dual career issues and EAS activities at the Italian Forum ‘Sports and University in Italy and in Europe’. Invitations to relevant University Sports events include the Rectors’ Conference ‘Organization and Management Model of University Sport’ organized during the 2018 EUSA Games (Coimbra, Portugal; July 14-15, 2018) and the 2018 FISU Forum ‘Student Sport: Springboard for Innovative Leadership’ (Krasnoyarsk, Russian Federation; August 6-11, 2018), which represent relevant opportunities to highlight the relevance of combining academic and sport careers. As Member of the Consultative Committee of the Enlarged Partial Agreement on Sport (EPAS) EAS will participate in the Joint Meeting of the Governing Board and Consultative Committee of the Council of Europe to be held in Strasburg on May 14-15, 2018. Finally, the 14th EAS Annual Conference will take place from 12th -14th of September 2018 in Coimbra, Portugal. The Conference will allow EAS members to share best practices, information on the recently EU-funded projects on Dual Career, and to attend the scientific presentation awarded the Bengt Nybelius Scholarship. Furthermore, the 2018 General Assembly will elect the EAS President and Executive Committee. Surely, these achievements and recognitions of the EAS role in the development of the European dual career could not have been possible without the contribution of the Executive Committee and the Members of our Network. I strongly encourage you to disseminate on the EAS website (www.dualcareer.eu) the activities carried out at local, regional and national levels and to be proactive in the recruitment of new EAS members, who could further contribute to the enhancement of European dual career.